This week's question: What are your all-time favorite book covers? 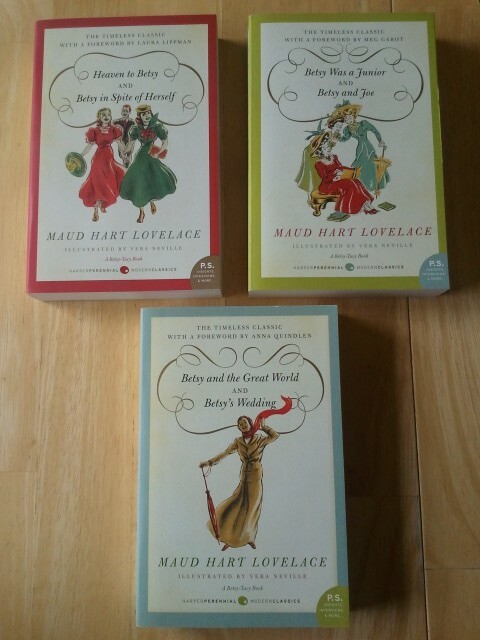 The covers that immediately came to mind: the Betsy-Tacy series by Maud Hart Lovelace. And it's not just love, I'm sorry to say. In the Betsy-Tacy world, there has been a bit of cover controversy over the years. 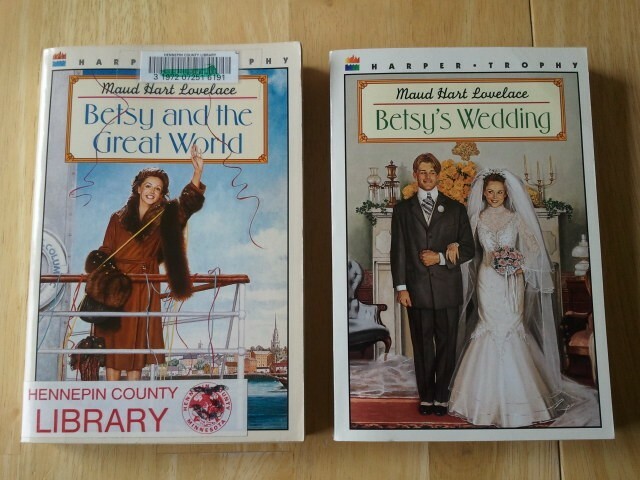 In the early 90s, the books were released with new artwork. Definitely not my favorite. 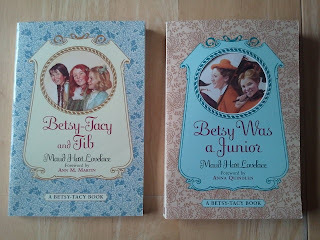 With scrawny legs and pointy chins, these were not the Betsy, Tacy, and Tib of my imagination. 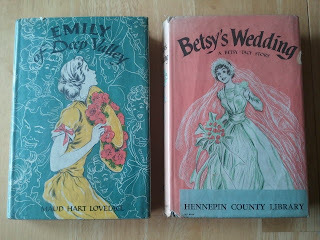 A few years later, an improved set of covers arrived, and the Deep Valley books were published in addition to the Betsy-Tacy books. This is the set I have given my daughter, although I am still missing a couple. And most recently, for the win, Harper Perennial Modern Classics has published lovely editions of all the Deep Valley books. 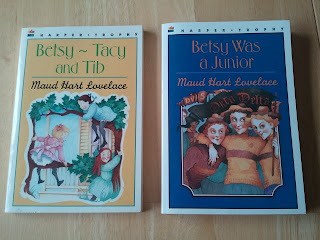 The last six books of the Betsy-Tacy series are paired into three books, and on November 8, 2011, the first four will be available as the Betsy-Tacy Treasury. Three other Deep Valley books are available as well: Winona's Pony Cart, Carney's House Party, and my favorite, Emily of Deep Valley. Even though I love the new editions, my favorites will always be the well-worn, much-loved, much-borrowed copies from local libraries -- Carnegie or otherwise. I am lucky to have several library discards in my collection, and when I'm feeling nostalgic I return to those tattered pages. 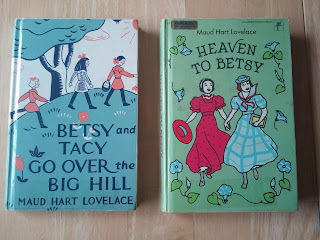 My favorite Betsy-Tacy book is Heaven to Betsy. What's yours? Love the Library ones at the end and also the 2011 reissue ones. I have some of the first ones. Oh what a wonderful reminder - I can't wait to reread these. And Lois Lenski rules!! Thanks for sharing the whole history of the covers. It's fascinating how they change over the years, isn't it? I had only ever seen the set you've given your daughter! Oh, I had forgotten how much I loved those books! I wonder if I still have any of them around...if not, I'm going to have to get the Harper Perennial ones. I absolutely remember that old green cover of Heaven to Betsy! 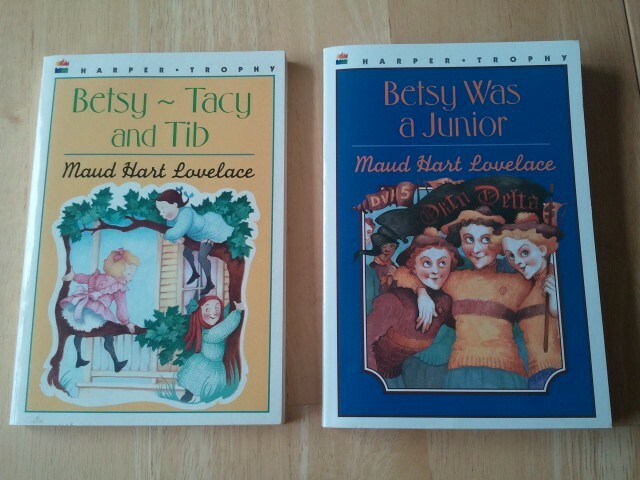 i LOVE the betsy-tacy books! betsy's actually the reason i started writing in the first place. those '90s covers were HORRIBLE, but the recent harper reissues are gorgeous. 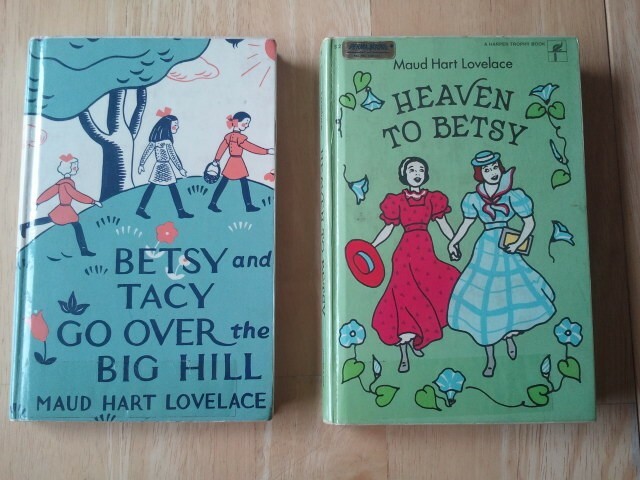 Heaven to Betsy is my favorite--and I agree w/ you on the covers! I keep meaning to comment on this... I was so horrified when I saw the new artwork with the Betsy-Tacy witches on the cover. Eeek! They look like witches! Why get rid of that beautiful, classic artwork by Lois Lenski? I still have my original series, purchased when I was about 8 years old. I also bought Carney's House Party, Emily of Deep Valley, Betsy and the Great World, and Betsy's Wedding. Ahhh, sweet Betsy-Tacy. I wish my daughter would take an interest, but she's more into fantasy. Sigh.